The New Speed 2.0 8" Side Zip Boot has been upgraded with a new lightweight upper and the ATAC footbed platform to give you the best duty boot performance at the most affordable price. From my experience, they are true to size but may vary depending on the individual. 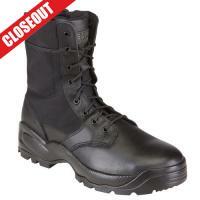 We will accept a return for these closeout boots if they do not fit properly.